I always struggle with ideas for stamping with Masculine cards, and I must admit I was stuck for some time then it was Gorgeous Grunge to the rescue and then inspiration flowed, I just couldn't stop myself, this is definitely not a "less is more" project! I triple, yes triple you did read right, heat embossed the Birthday years - this gave them a super smooth finish. 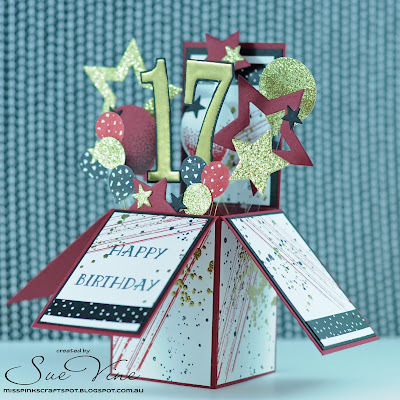 The Number of Years bundle is fantastic, stamps and framelits so you can accommodate any year. I went a bit crazy with cutting stars and punching balloons,but it was so much fun seeing the project take shape as I layered it up. 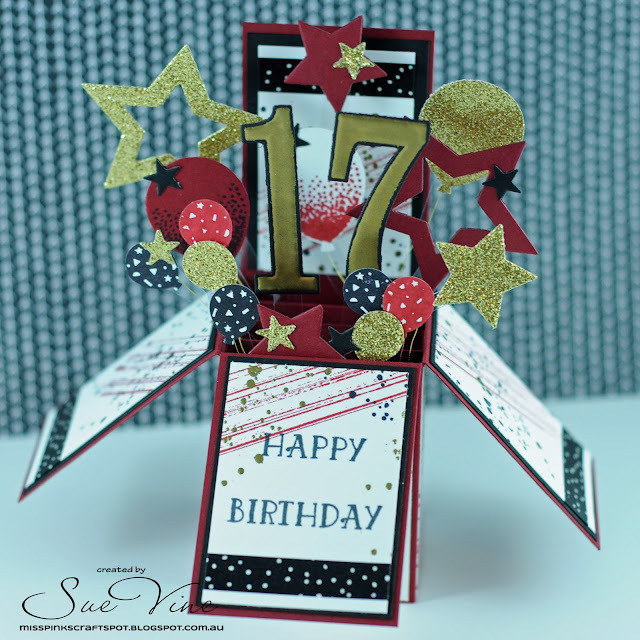 The is a larger panel on the back for you to write your special birthday message. Remember, during Sale-A-Bration for every $90 AUD spent you qualify for an exclusive limited edition free item. Remember items on pages 16 -19 of the Sale-A-Bration catalogue are only available through to February 15th - Don't miss out! Turn something you love into so much more .... Pay $169 and get $295 of product! Wow! Sue, your masculine birthday card is fabulous! Those triple embossed numbers along with the stars and balloons were awesome! 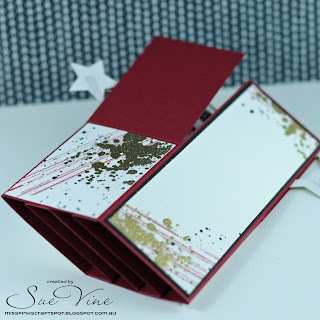 Thanks so much for joining us at Stamp, Ink, Paper for our color challenge this week! Very well done!! I just love the card in a box, I have only made two, and while they are fun, they are also a lot of work....so thank you for sharing!! Nice job with the triple heat embossing....beautiful!! I, too, take inspiration from Gorgeous Grunge/it is a fun set!! 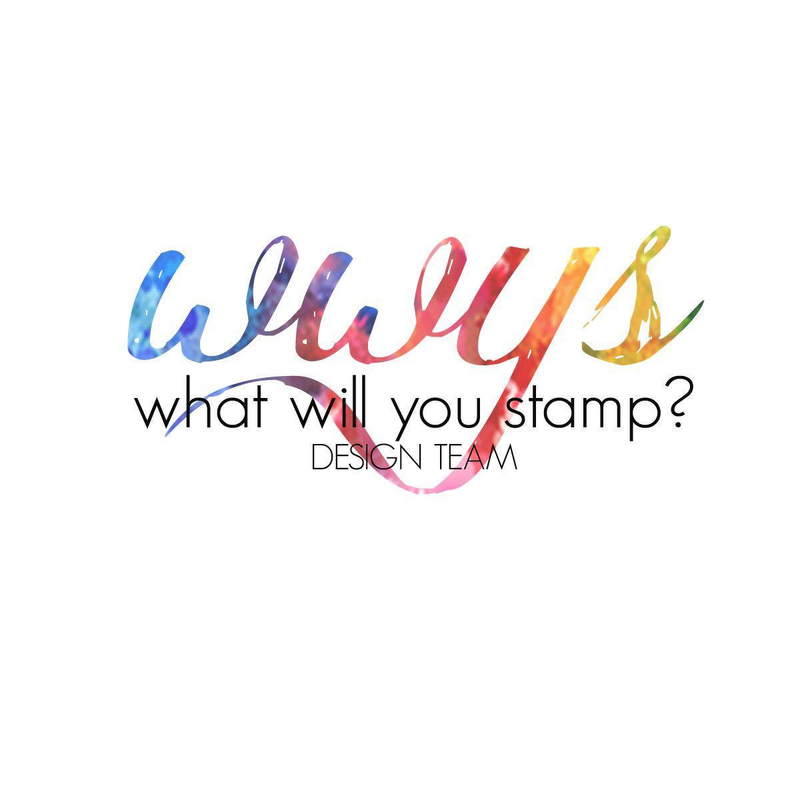 :) Thank you for joining us at Stamp, Ink, Paper!! WoW! such a creative box card. It's perfect! Thank you for joining us the color challenge this week at Stamp Ink Paper. Very Beautiful! How did you make the balloons and stars stand up and look so thin.... wire??? Love it! Thanks for sharing! !